The mainstream of biblical scholarship has resisted change vigorously, preferring whenever possible to defend a paraphrase of the Biblical take as “the Bible’s view of the past.” Many in the field of Biblical archaeology have gone so far as to argue that this traditional history should be maintained as valid except where it has been proven to be historically impossible. Only in very recent years has archaeology begun to develop a history of Palestine independent of such theological prejudice. For more than three generations, most of ancient history has attempted little more than to paraphrase old stories and legends. Historians who write of ancient Greece have their Herodotus, Egyptologists their Manetho, Assyriologists their Berossus, and the students of Phoenicia their Philo of Byblos. Even Judaic studies has its Josephus! If such interesting ‘histories’ work, and we somehow need them, why listen to critics who would undermine them? Palestine never developed a political power of any great international significance. It was always so divided by its many small regions that it never developed a common history except when it was controlled by some power from outside, such as Egypt, Assyria and Babylonia. High culture, as expressed in art, architecture, literature and pageant, hardly existed. Most of what has survived is either foreign in origins or derivative from Phoenicia on the Syrian coast. One of the most striking things about an ‘historian’ like Josephus is that he knows almost nothing about ‘the past’ that we ourselves do not already know from other sources. When an account he gives of a supposed event of two centuries earlier ‘confirms’ something we can read in other works, it is only because he has copied or paraphrased it. Josephus has been well described as a person one wouldn’t by a used car from. 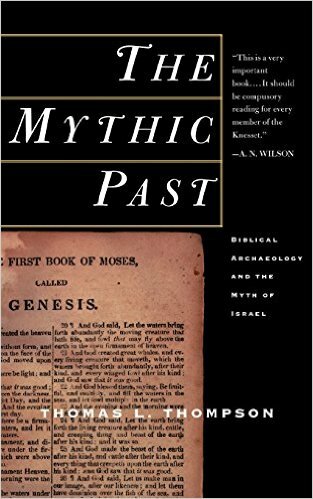 While it is a hard-won principle of biblical archaeology that the historicity of ancient biblical narratives about old Israel cannot be confirmed unless we have extra-biblical evidence, it is just as important to be aware that even when we do have such extra-biblical confirmation, it is more likely to confirm the Bible’s literary and metaphorical tropes than to establish it as historical record-keeping. In Genesis II, we are given a list of Shem's descendants, which describe the spread of the Semites throughout Asia. We come to Terah...and eventually to the stories of Abraham. These narratives offer legendary origins of nations as Abraham fathers them according to their lands and languages. Such genealogies and stories are not history writing, but folk etiologies. The new history of Palestine’s peoples and their distant beginnings stems almost entirely from archaeological and linguistic research undertaken over the past fifty years. It presents a picture so radically unfamiliar, and so very different from a biblical view as to be hardly recognizable to the writers of the Bible. Although Palestine continued throughout the Bronze Age as an illiterate backwater, this was not true of Phoenicia. Its towns resembled the great cities of Syria. A literate artistic culture of considerable merit developed at Ugarit in the fourteenth and thirteenth centuries, and scribes communicated regularly between the major towns of Palestine, from Bythos, Shechem and Jerusale and the Egyptian court. Writing had long been established in Syria, at the market town of Ebla, from as early as the twenty-fourth century BC, and a few examples of literary texts have been found from Alalakh and Megiddo. Phoenicia lead the way to a wider literacy through the development of the alphabet. Jerusalem’s history…remains impossible to write. Although the Egyptian Amarna letters, which give us correspondence between Palestine’s petty princes and kings and the Egyptian Pharaoh of the late fourteenth and early thirteenth centuries, tell us much of about the town of Urusalim and about its patron and king, Abdi-Hepa, we know nothing about this town from archaeology. We are not even certain where it was located, thought we have every reason t believe that it was Jerusalem. The Iron Age town of Jerusalem on Mount Ophel, which had been excavated by Kathleen Kenyon before the 1967 Israel-Arab war offered no significant remains form the Late Bronze Age. It is possible that the earliest references to Yahweh occur in the Early Bronze Age. The earliest group of texts that may contain the name comes from the Syrian city of Ebla, where the element yaw included in some personal names could be an abbreviated form of the divine name Yahweh…The Bible frequently recognizes that Yahweh was worshipped by others than Israel. The Persian Yahweh is accompanied by Asherah, and Ba’al. Baal is from Celtic Bel. The patriarchs of the Genesis were not historical. The assertion that 'Israel' was already a people before entering Palestine whether in these stories or in those of Joshua has no historical foundation. No massive military campaign of invading nomadic 'Israelites' ever conquered Palestine. There never was an ethnically distinct 'Canaanite' population whom 'Israelites' displaced. There was no 'period of the Judges' in history. No empire ever ruled a 'united monarchy' from Jerusalem. No ethnically coherent 'Israelite' nation ever existed at all. No political, ethnic or historical bond existed between the state that was called Israel or 'the house of Omri' and the town of Jerusalem and the state of Judah. In history, neither nor Judah ever shared and identity with Israel before the rule of the Hasmoneans in the Hellenistic period. The history of the transference of peoples from Mesopotamia to Jerusalem and Judea escapes us. We find explicit narratives of the building of Jerusalem and of the temple in Ezra, Nehemiah, I Esdras and Josephus: without much agreement…the history of Jerusalem and of Judah from the sixth to the fourth century was dominated by the rebuilding of Jerusalem and the establishment of a community centered on the temple dedicated to Yahweh, is neither known nor obvious. Although the name Judea is a geographical term occurring in Assyrian period texts, referring to the highlands south of Jerusalem, in the Persian period the name is political. It is the name of the Persian province. The Assyrians’ name for the southern highlands, Jaudaa, and the Persians’ imperial name, Yehud, were no more reflective of a people than were any of the other names for regions of the empire. Moreover, the geographical spread of people referred to as Yehudim is so great that it would be rash to assume that this name refers to their place of origin. Nor should we continue to understand this term as ethnographic, without evidence. We know that large ‘Jewish’ communities were established as far away as Babylon, Alexandria and Rome during the Hellenistic and Greco-Roman periods. Thus a significant population of deportees and their descendants from various regions formed part of most large cities in antiquity seems to be likely. Literacy in the ancient world was mastered by a very small part of any given society. Small farmers and shepherd had not use for writing, nor did the local patrons and strong men who typically controlled the small patronates in Palestine…Imperial governments, however, did have use for it. However much archaeologists might need a story world to flesh out the bones of their history, or however much they might wish that the Bible's nations were scattered among the potsherds, the wish for the Bible to history has only confused the discussion about how the Bible relates to the past. The Bible's world does not belong to the discipline of archaeologists...It may perhaps appear strange that so much of the Bible deals with the origin of a people that never existed as such. This metaphorical nation's land and language; this imagined people's history, moreover, is an origin tradition that belongs to the 'new Israel' not the old. The Bible does not give us Israel's story about its past - or any origin story confirming Israel's self-identity or national self-understanding. The tradition gave not Israel but Judaism an identity. When we ask whether the events of biblical narrative have actually happened, we raise a question that can hardly be satisfactorily answered. As a whole, we historians have not done very well in using Biblical stories to write our history with. If one feels bound to understand the history of Israel as a revision of the Bible's traditions, one must admit the near total lack of warrant that these stories have for being accepted as historical. The earliest part of this period in the hill country has been traditionally presented as the "Golden Age" of ancient Egypt with its capital in Jerusalem. The era has been associated with the "United Monarchy" wielding the political power of a Saul, a David and a Solomon and controlling a land-bridge from the Nile to the Euphrates, as well as with the concept of a temple built by Solomon as the center of worship of Yahweh. These images have no place in descriptions of the real historical past. We know them only as a story, and what we know about such stories does not encourage us to treat them as if they were or were ever meant to be historical. There is no evidence of a United Monarchy, no evidence of a capital at Jerusalem or of any coherent, unified political force that dominated western Palestine, let alone any empire of the size the legends describe. We do not have evidence for the existence of kings named Saul, David or Solomon; nor do we have evidence for any temple at Jerusalem in this early period. One cannot speak historically of a state without a population. Nor can one speak of a capital without a town. Stories are not enough...The immediate origins of this population rested in then settlement of the displaced part of the population that had abandoned the lowlands in the wake of the Mycenaean drought. The Bible knows nothing or nearly nothing of most of the great, transforming events of Palestine's history. Of historical causes it knows only one: Palestine's ancient deity Yahweh. It knows nearly nothing of the great droughts that changed the course of Palestine's world for centuries, and it is equally ignorant of the region's great historical battles at Megiddo, Kadesh, and Lachish. The Bible tells us nothing directly of four hundred years of Egyptian presence. Nor can it take on any role of teaching us anything about the wasteful competition for the Jezreel in the early Iron Age, or about the forced sedentarization of nomads along Palestine's southern flank.